UK Championship Snooker is back for 2018 and you’re no doubt as excited for this as I am. The action kicks off on 27th November. It’s by far the leading Snooker competition on the UK circuit with players from across the globe including China, Thailand, Iran, Switzerland, Finland and of course the home nations England, Scotland, Wales and Northern Ireland. 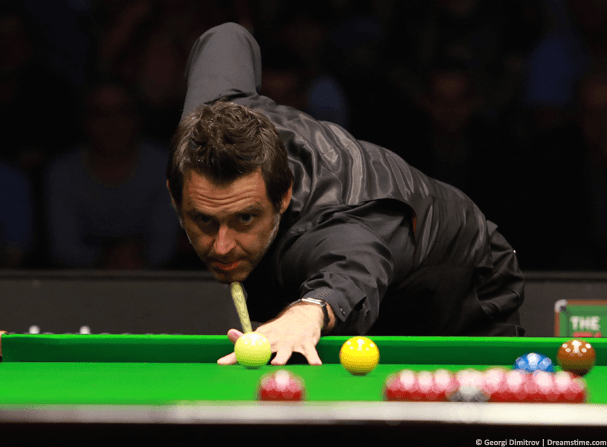 Ronnie O’Sullivan is the current champion and will be back again this year to defend his trophy. O’Sullivan is without question one of Snooker’s top players but recent comments about the process to attend the tournament have caused a stir before any shots have been played. If you want to watch the UK Championship Snooker outside the UK in Spain, China, Thailand, Australia or anywhere else in the world then your options can be severely limited. The great news is you can watch the majority of the tournament in any country on the official UK broadcast by the BBC but for this you’ll need to use an app called a ‘VPN‘ which I’ll explain below. This is available on both mobile devices and regular desktop and laptop computers. It’s even available on the Amazon Fire TV / Fire TV Stick. If you try and watch the UK Championship Snooker on the BBC iPlayer service and you’re outside the UK then you’ll be blocked. However, by using a VPN app from a provider such as ExpressVPN you can change your location. This will make it appear like you are in the UK which will allow you to watch all of the UK Championship Snooker action in any country. It’s really simple to use a VPN on any type of device that will let you watch the UK Championship outside the UK. Just follow the steps below and you can be watching live within minutes anywhere in the world. NordVPN – Easy to use, great for beginners. 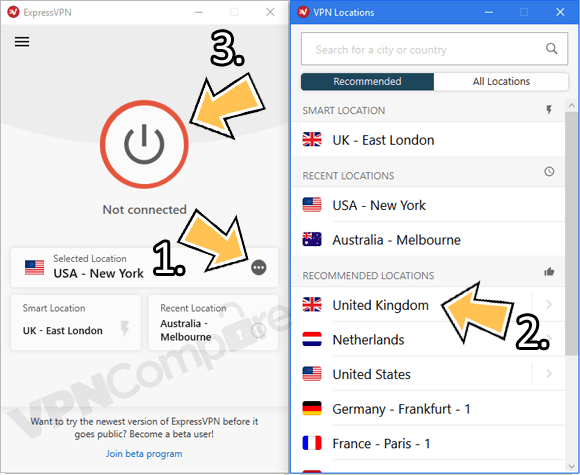 Then follow the steps below (I’m using ExpressVPN but the process is almost identical with the others). Now you’ve signed up download their app. For ExpressVPN, for example, you can grab it from their ‘Products’ section or your regular app store. Once the app has connected watch the UK Championship on BBC iPlayer or use their app. It’s easy to watch the UK Championship with ExpressVPN. You’ll now be able to watch all the games as they’re shown live and any that you miss on catch-up TV. You will need to create a free BBC iPlayer account if you don’t already have one. Watching the UK Championship on a desktop or laptop is really easy. Once you’ve connected to the VPN you can simply hop over to the BBC iPlayer website and watch. If you’re on a phone or tablet then it can be a little more difficult if you’re outside the UK and you don’t already have the BBC iPlayer app installed. If you’ve got a UK registered device then you should be able to just visit your regular app store, search ‘BBC iPlayer’ and install it directly. Then use the VPN app to connect to the UK and open the BBC iPlayer app. To install the BBC iPlayer app on an iPhone or iPad you’ll need to follow this dedicated guide which shows you how to install outside the intended country. You’ll need to sign up to ExpressVPN to watch on an Amazon device and then use a web-browser such as Silk Browser or FireFox to watch BBC iPlayer. It won’t work with the dedicated BBC iPlayer app. To watch all the Snooker action outside the UK you’ll need to get yourself a VPN app. The best for the job is ExpressVPN. You should sign up to their service using the link below. It’s worth taking their 12-month package because you get 3-months free which makes it 49% cheaper than paying on a monthly basis. This will let you watch a heap of Snooker throughout the year. There’s also a 30-day money back guarantee just in case you can’t get it working. Once you’ve signed up download their app and connect to the UK. You can now watch the Betway UK Championship live on BBC iPlayer in any country. Thanks for taking the time to post. We’ve updated the article with your recommendation as they only show the most important stages.